I made some updates recently to Traffic Jam for Windows 8 and it recently hit 100,000 downloads! It’s getting about 500 downloads/day now which is respectable. For comparison, Super Picross for Windows Phone is at about 40 downloads/day yet it produces more ad revenue than any of my other games. The ‘daily puzzles’ are what keep people coming back to the app. Traffic just hit 400,000 downloads on February 5! Window Phone 8 has definitely helped boost downloads, I’m getting close to 800 a day again after dropping quite a bit. Super Picross hasn’t had nearly as many downloads but it seems to get almost as many ad impressions. The Daily Puzzle feature is great for getting people using the app regularly. It’s a lot of fun playing the submitted levels too. It’s been great to get reviews for Super Picross from people who are enjoying the daily puzzles! The list of puzzles is getting quite large, to the point where I need to make an update to organize them better. It’s on my list of things to do, as well as some ports to windows 8. With that in mind, I am taking 2 weeks off work to go to Tanzania! Thankfully there are enough daily puzzle submissions that I can set them in advance and not worry about it. My 3rd game Super Picross just got released to the WP7 marketplace! If you’ve never played Picross/Griddlers before it can be as addictive as sudoku and in my opinion much more awesome. 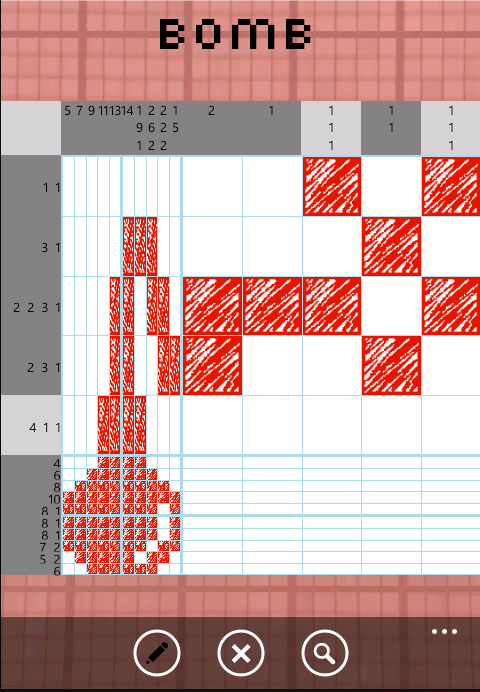 I’m a big fan of logic games and I wasn’t satisfied with the current Picross games in the market so I made my own. The big challenge with Picross games is that the phone screen isn’t big enough for large puzzles so to keep it all touch controlled there has to be a zoom feature. I modeled the zoom feature off Pixelogic for iPhone, dynamically resizing the grid to focus on a 5×5 section. I think it works pretty well but it might take some getting used to. There’s only 24 levels in the original release but I’m hoping the daily puzzles will make up for it. There’s a level creator and submission system so each day I’ll be adding a new puzzle. I’m getting bored with playing my own levels so I want to try some of yours :). I added 60 more levels to Traffic and fixed some bugs. The game should be available in a lot more countries now once their marketplaces open. There was an annoying bug where the application settings were getting cleared, and this caused the review prompt to appear multiple times for some people. I removed the crash reporting by email since Microsoft shares crash reports to developers now. I also updated the advertisement control to use the latest SDK.